Themistoklis Asthenidis, a staff member of the Alliance of Conservatives and Reformists in Europe- ACRE, who illegally visited occupied Azerbaijani territories, sent an official letter to Azerbaijan's Embassy in Belgium asking not to be put to the list of foreign nationals who illegally visited the occupied territories, the Azerbaijani Foreign Ministry said in a message May 14. In the letter, Asthenidis noted that he paid a visit to Armenia as part of an official delegation to Yerevan in December 2017, where an ACRE event took place, and admitted that he visited the occupied territories without prior notice. In the letter he states: “As part of our visit to Armenia, our local partner organized a series of tourism activities for members of our delegation. Prior to our departure for the activities on the day, I was absolutely unaware of the intention of our local partner to also take me to the occupied Nagorno-Karabakh, as at the time of departure, the specifics of the visit were intentionally unclear and, I recognize, retrospectively misleading." Asthenidis further reaffirmed his full respect to the territorial integrity and sovereignty of Azerbaijan, recognizing Nagorno-Karabakh as an integral part of Azerbaijan. "He noted that his visit does not constitute any recognition of the illegal occupation of Azerbaijan's territories, and stressed that as a professional lawyer, he is very well aware of the legal and political sensitivities around the issue of our occupied territories," the ministry said. "He expressed his sincere regrets for this action and asked for permission to visit Baku in June 2018." 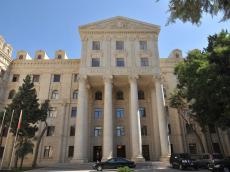 The Foreign Ministry said that Asthenidis's appeal was considered in a due manner and a decision was taken not to add his name to the “List of Foreign Citizens who Illegally Visited the Occupied Territories of the Republic of Azerbaijan”.